This is another United 747, this time a 747-200 in the classic tri-color cheatline livery. United's active fleet is a mix of battleship grey (the succeeding livery) and the blue-on-white fading tulip (the current livery). This travel bug is eager to go see its birthplace in Everett, and I'm helping him reach that goal. 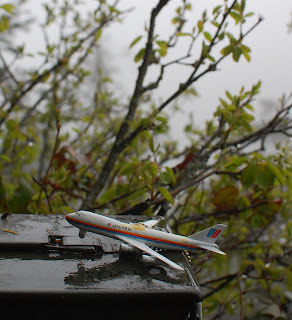 He traveled from Australia to the very edge of his 6850nmi range, landing in dense fog in Larrabee State Park.